Osaka. Home, Osaka. About 2 1/2 Years Ago he had his last Young Lions Match at Osaka and at that time he said this was his home, the guys out back & each of the fans were his family. Boy was he wrong. None of them think he deserves the belt or could make it to the top. They didn’t think he could beat Kenny and he beat him. They didn’t think he could beat Tanahashi and he beat him. They didn’t think he could beat Okada and he beat him. And just to put the icing on top so there’s no doubt in anyone’s minds he beat Tanahashi again for the title. He is the champion in spite of everyone of them and intends to spit in their face, and that’s what he’s doing metaphorically by holding the belt. He doesn’t play by the rules. He doesn’t show heart & passion like Tana, but no, no it doesn’t matter because he is the real IWGP Heavyweight Champion. He doesn’t do this for any of them, he does this for himself, for Gedo, for the Cut-Throat Era Bullet Club. 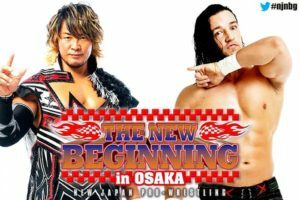 It is a New Dawn, a New Age, a New Beginning and Tana and all of the fans can only BREATHE WITH THE SWITCHBLADE! WELCOME TO HIS NEW ERA!